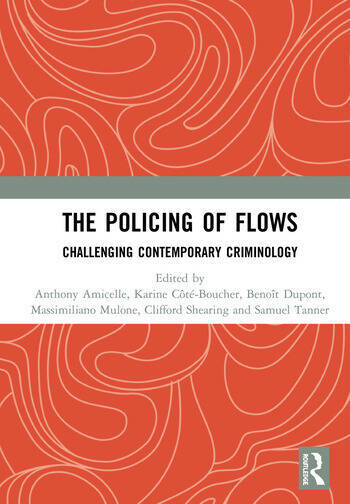 Rectifying the fact that little criminological attention has been paid to the notion that the security of flows increasingly embodies concerns at the heart of contemporary policing practices, this book makes a significant contribution to knowledge about the policing and security governance of flows. The book focuses on how the growing centrality of flows affects both contemporary 'risks' and the policing organisations in charge of managing them. The contributors analyse flows such as event security; border controls and migration; the movement of animal parts; security-related intelligence; and organisational flows. The emerging criminology of these, as well as well as flows of money, information and numerous commodities, from pharmaceuticals to minerals or malicious software, is leading to critical advances in the understanding of the changing harm landscapes and the practices that have developed to manage them. Taken as a whole, the book opens up the conversation, and encourages the invention of new conceptual, theoretical and methodological tools to help criminology tackle and better understand the mobile world in which we live. This book was originally published as a special issue of Global Crime. Anthony Amicelle is Associate Professor in Criminology at the Université de Montréal, Canada. His research examines practices of policing, surveillance and intelligence at the interface of finance and security, especially with respect to counter-terrorism and financial crime such as money laundering. Karine Côté-Boucher is Associate Professor at the School of Criminology at the Université de Montréal, Canada. Her research focuses on border control—with a current focus on the relations between customs, logistics and the transportation industry. Benoît Dupont is a Professor of Criminology at the Université de Montréal, Canada, where he also holds the Canada Research Chair in Cybersecurity and the Research Chair in the Prevention of Cybercrime. He is the Scientific Director of the Smart Cybersecurity Network (SERENE-RISC), one of Canada’s Networks of Centres of Excellence. His research interests include the co-evolution of technology and crime, as well as the polycentric governance of security. Massimiliano Mulone is an Associate Professor in Criminology at the Université de Montréal, Canada. His research interests include the privatisation of security, with a specific focus on the relations between the police and private security companies, as well as police deviance and its management. Clifford Shearing is a Professor in the School of Criminology and Criminal Justice at Griffith University, Australia. He leads the Global Risk Governance Programme in the Law Faculty at the University of Cape Town, South Africa, and co-leads the New Securities Programme at the Griffith Institute of Criminology. A focus of his academic work has been on broadening boundaries of criminology, with a primary focus on 'security governance’. Samuel Tanner is an Associate Professor in the School of Criminology at the Université de Montréal, Canada. His current research interests mainly focus on media, communication and security, especially on the role, policies, practices and impact of information and communications technologies for security purposes. He also works on violent extremism, focusing on Canada’s far right.